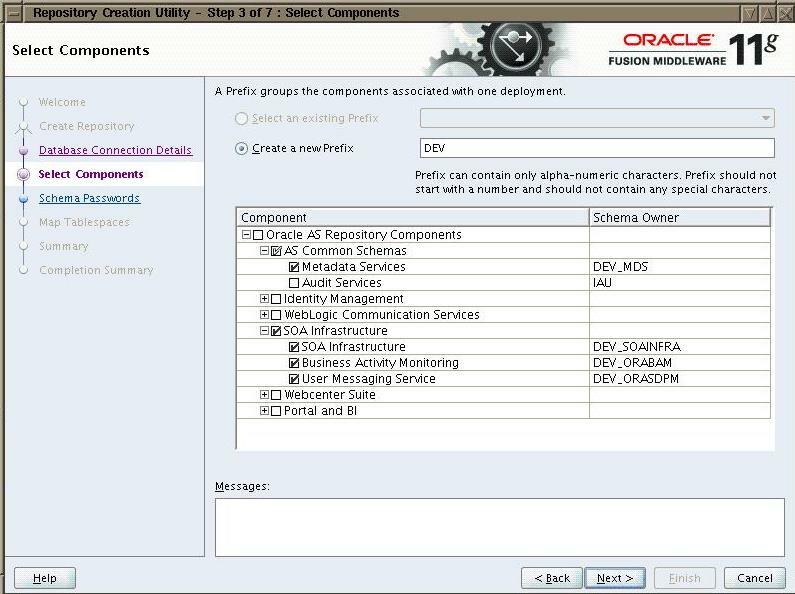 In this post we will see detailed steps to install SOA 11g. The approach used in all 11g FMW components (Including SOA) is very different then 10g. The basic limitation of any 10g component involving infrastructure was that the product itself used to create database and configure the entire infrastructure. This used to put limitation on database port which always used to be 1521. Here in 11g version, a user has a flexibility to use any port. 11g expects installed database as a pre-reqs and uses that database to create corresponding repository. This way we can have database and listener at any port and provide that information while creating repository. Also another important feature with all 11g components is that web server used is weblogic and it is kept as another separate component in the form of pre-reqs. 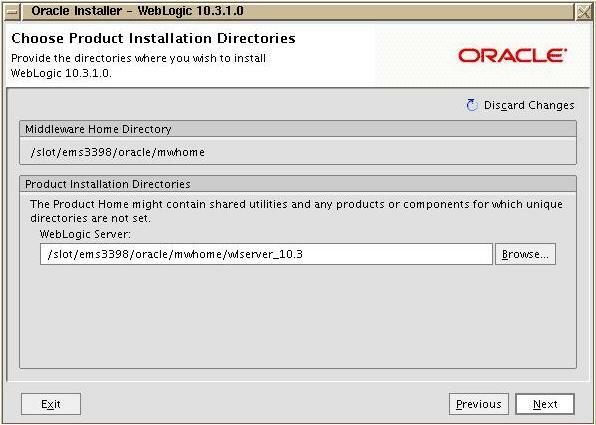 So any 11g components requiring web server expects weblogic as pre-reqs. With this brief introduction about 11g FMW components characteristics we will see the installation procedure for SOA 11g. 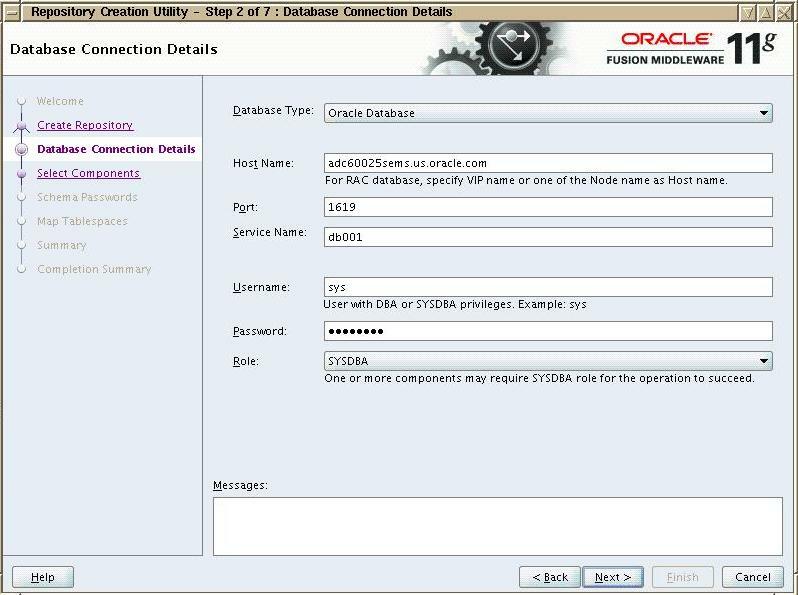 For this you can refer previous post for database installation and create a 11g database. Also create a listener on any available port and configure TNS for the database. This will invoke a GUI. On the first page you can select “Create Repository” and click on next. Once you connect to database, on the next page you need to select the repository that you want to create. Here you can select SOA as shown below. Metadata services will get selected automatically. Also you can use any prefix for these schema. All these schema created will have the prefix string prefixed to it. In this case it will prepend DEV before each schema name. Example DEV_MDS, DEV_SOAINFRA etc. Once you click on next, it will show the summary and will create tablespace if they dont exists. After tablespace creation, click on create and it will create the required repository schemas. Next step is to install WLS server. Carry out the basic installation of WLS. You need to provide a new location for middleware home when asked for as shown below. Next it will ask for the location of weblogic. Here you can accept the default value as it will be created inside middleware home. Select all other values as default and install WLS. 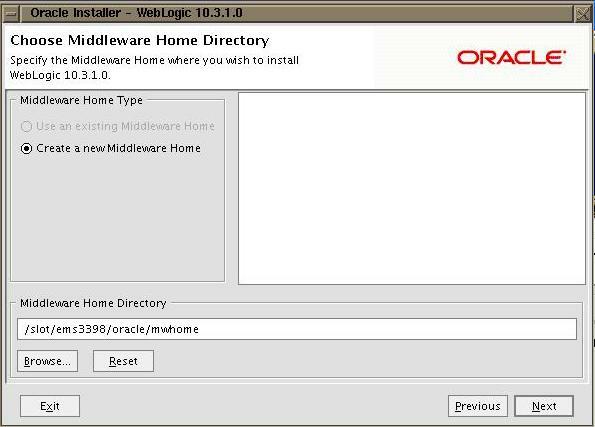 Here Oracle_SOA1 directory will get created inside mwhome directory. Rest of the inputs for SOA installation can be default. Once SOA installation is done, the last and the most important step is configuring SOA domain. You need to navigate to <middleware_home>/Oracle_SOA1/common/bin location and run config.sh script. This script will open a new GUI window. 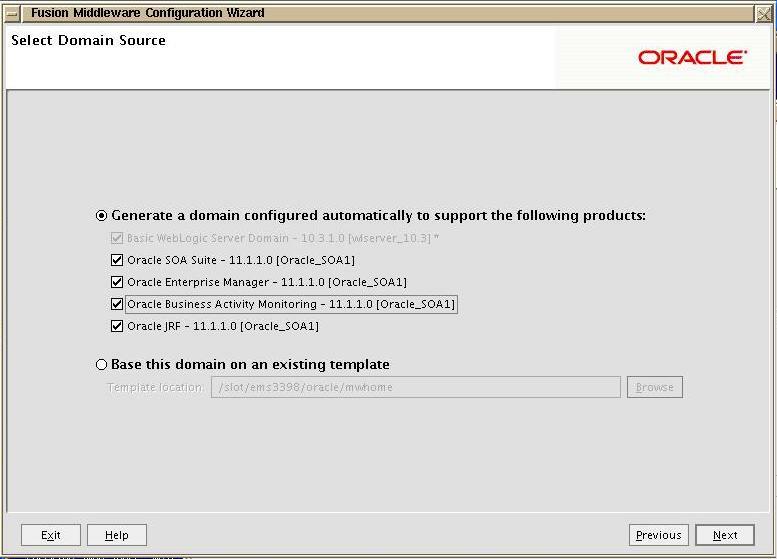 Follow the below screen shots for configuring SOA. Select all the required template from this screen. If you don’t need BAM installation, you can uncheck the Business Activity Monitoring template. Click on Next. On the next screen give any domain name (soa_domain) in this case. You can keep the Domain location and Application location as default. These directories will get automatically created when this domain gets created at the end of installation. Click on Next. On this screen, provide the weblogic password and click on Next. On this screen you need to provide the database connection details like database name, hostname and database port. You also need to provide all the schema names and password you created using RCU. 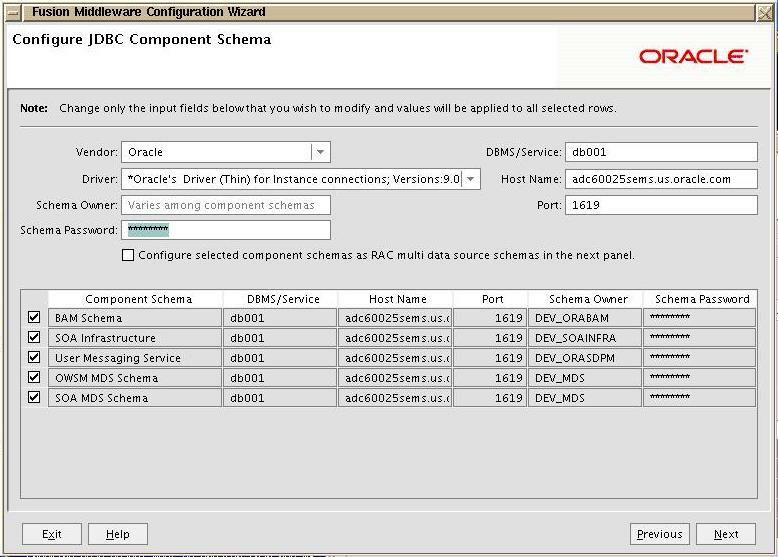 RCU will create exact 5 schemas required for SOA configuration. You need to provide details of those schemas on this screen. Once you click in next, the configurator will test the connection for all 5 schemas. Once the connection test goes successful, you can keep rest of the values as default and create the required domain. In the next post, I will provide the WLST details instead of config.sh for performing tasks in step 5) above. Like it or not, the DNA of IT is changing. Thanks to economic slowdown and cuts in IT budget, CIOs have to go lean and ensure good returns on IT spending. They have come under pressure to change their traditional approach to IT development and seriously explore technologies and approaches such as Cloud, SaaS, SOA, Lean IT, Green technologies and so on. Developers, architects and other IT professionals have also come under pressure to adapt to the changing IT landscape. They have to rethink the tools of their trade, the platforms they use, get familiar with emerging approaches and frameworks to stay relevant. There is one conference which offers them a front row seat to the rapidly changing IT world. Business Technology presents Third Annual Edition of SOA & Cloud Computing India 2009 Conferences, 15th October at Bangalore. The international conference is designed to give progressive executives and developers a ringside view of the current developments in the emerging critical technologies. It will feature technical sessions from leading industry players of the Cloud ecosystem – the infrastructure firms, the platform providers, and application developers. SOA India 2009 caters to the need of Indian Enterprise IT community of CIOs, CTOs, Management, IT directors, IT managers, IT architects, Network and Infrastructure specialists, Project Managers, Project Leaders, and Software Architects. If you are responsible for business optimization, designing, developing and/or implementing your organization’s IT strategy, join us this year for an unbiased source of insight, and expertise from the top experts to ensure the success of your initiatives. To avail early bird discounts or for more information Call +91 080 41124392/93 or visit conference website http://www.soaindia.com. Excellent article for newbees. Thanks for sharing. After installing soa 11g soa suite, i am not able to view all the components of soa like BPM, BAM etc in my start up. anything I am missing? what is the next step just after completing soa suite? I’m a newbee to this and I really appreciate the installation guide. Right now I’m doing some java training online and I’m sort of muddling through the material. 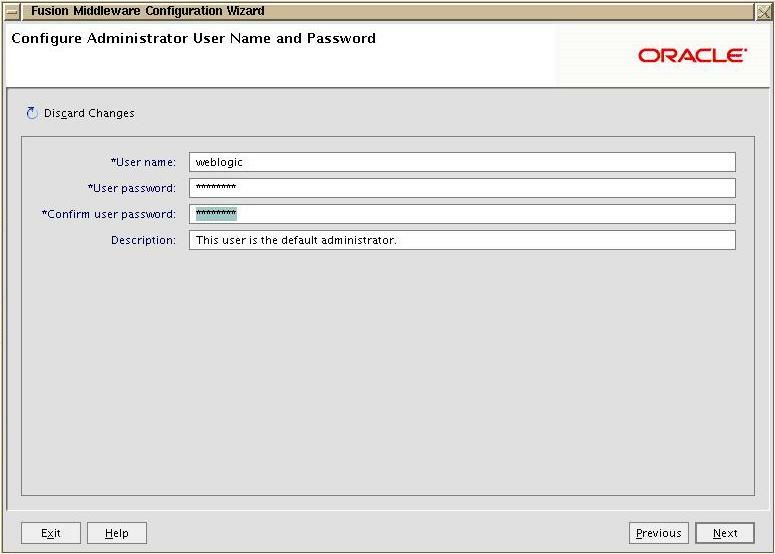 I’m new to Oracle and this is a good overview of the configuration info. significantly relating to this subject, produced me personally consider it from so many varied angles. accomplish with Lady gaga! Your own stuffs excellent. Always maintain it up! Mutex: What do we know ? How many checkpoints in Oracle database ?